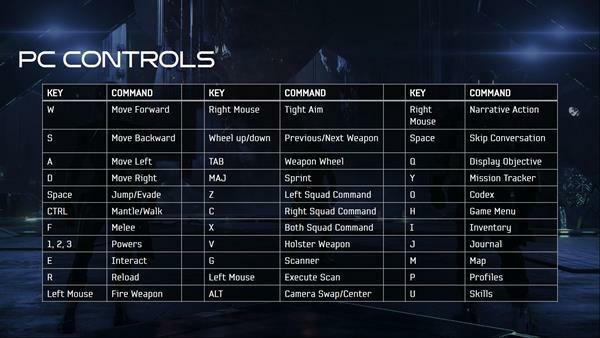 Controls in Mass Effect Andromeda are listed below for all platforms. You can change your settings by going to your control settings menu from in-game options. You can customize your controls for Mass Effect Andromeda by going to your settings. You may use keyboard and mouse, or an external controller plugged into your PC. The default controls are shown below. Click to enlarge. I have just installed and started. Game isn&apos;t acknowledging mouse or keys to configure, enter etc and I don&apos;t have a controller. How do I get started if enter key or mouse don&apos;t work. I don&apos;t know what to type in console. Noob.